Since the advent of the most famous cryptocurrency, Bitcoin, released in 2009, to this day the number of sellers or merchants accepting digital assets is still ridiculously low. A number of reasons have been offered to explain this, for example, the slow speed of transactions; but real solutions that would help solve this are still to be found. Recently, a promising blockchain technology, Ethereum, released in 2014, has been bringing faster transactions, addressing one of the main Bitcoin issues. The possibility to execute code called smart contracts and the recent release of the ERC20 token standard, based on these very contracts, has enabled new concepts to emerge. Some of them involve the possibility to use physical credit cards backed by cryptocurrency accounts, thus enabling customers to effectively pay in cryptocurrency. That’s a perfectly suitable workaround, but the main problem remains: sellers and merchants still do not accept digital assets as easy as cash or credit cards and both customers and sellers are still paying exorbitant interchange fees to the banks when using credit or debit cards or when withdrawing cash at ATMs. Believing that the main problem for sellers and merchants to accept a cryptocurrency is both change resistance as well as core technology issues, we are proposing an innovative mixed solution with a clear update path to bring sellers to accept any cryptocurrency, anywhere, anytime. Reducing payment friction by enabling real-time payment feedback using a smooth Web application interface and realtime technology. Enforcing buyer’s trust as the payment happens on the buyer’s device. Buyers are inclined to trust their own phone more than a stranger’s POS system. As such, SelfPay is providing solutions covering each use case. From informal offline merchants (Instagram / Facebook, etc.) to small and medium online businesses. 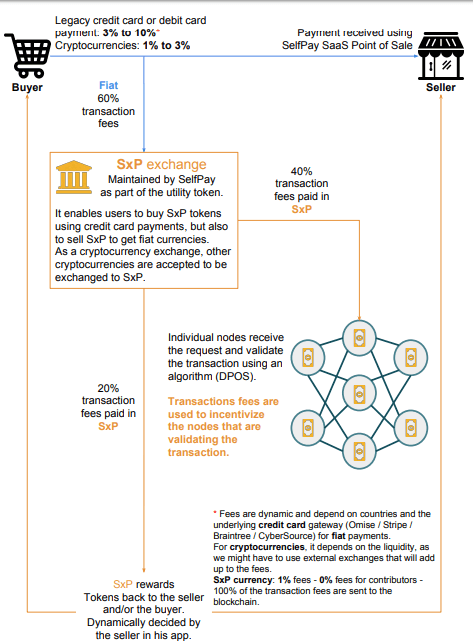 Besides our frictionless payment system, we are incentivizing sellers and/or buyers to use our solution by giving them SxP tokens back equivalent to 20% of the fees of each transaction made using the platform. 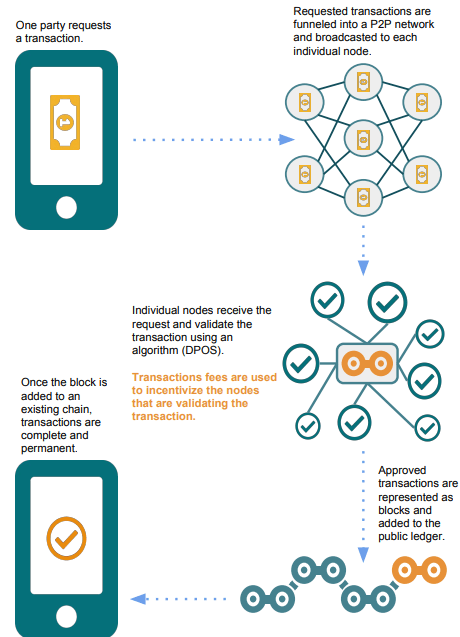 SelfPay is built with a modular architecture that allows payment gateways to be swapped in and out in a seamless fashion. This allows the user to select their preferred payment gateway depending on their business context and the country their business is targeting. The modularity allows SelfPay customers to adapt their payment gateway to a more favorable one as their business grows or shifts. It also allows SelfPay to expand to new regions and territories with great ease. By simply layering new payment gateways on top of SelfPay’s solid foundations, we can grow the portfolio of gateways that SelfPay supports linearly. SelfPay is a SaaS (Software as a Service) solution, and provides payment functionalities by integrating local payment gateways (Stripe, CyberSource, Omise, etc.). As such, the security and PCI compliance are provided by the local e-payment gateway; credit card numbers are never hitting SelfPay’s servers, providing the highest possible security. Instead of trying to force the buyer to use another mobile application or even a wallet application, the buyer’s application is a Web app that does not require any installation. It is built to be mobile friendly and to use the latest HTML and CSS technologies to provide a responsive and real-time transaction feedback. It automatically opens when you scan a QR code or when you follow the link sent from the seller via SMS or chat. Taking the opportunity that, in Asia, the transaction fees are very high and always added on top of the final price, instead of proposing loyalty point to customers that are mostly tourists and will unlikely return, we are sharing those transaction fees with the seller and our ICO backers! We are building on top of other existing technologies such as using payment aggregators instead of setting up our own payment gateway which is time consuming. We’re leveraging the Ethereum blockchain technology to bring cryptocurrency transaction to small and medium businesses. We are targeting South East Asia first – as an Asian based team and company, we know that our product is answering the local payment needs. Typically SelfPay enables the critical step of entering credit card information, to be performed on the buyer’s device, helping to build up the trust that is needed in transactions in Asia. After 2 man years of development, the first alpha version of SelfPay was released in mid-2016.This version was then iterated upon to work as a payment aggregator, and by the end of 2016, the new version was released incorporating aggregation functionalities and a new design. The release laid the groundwork enabling the product to work as a SasS (Software as a Service) to accept payments via different payment gateways.This version of SelfPay was alpha tested in two Southeast Asian countries using Omise (creator of the OMG token) and CyberSource (the parent organisation of VISA) as payment gateways. Building on top of the existing product, version 2.0 of SelfPay begun a period of beta testing with a few selected trusted testing users.The payment aggregator functionalities became validated. Sellers could man age their own payments both offline and online with self-managed payment gateway keys and their own contracts with their preferred payment gateways.During that time, while the team was investigating new ways of funding SelfPay to maintain its growth, the ICO project began.During Q3 2017, the ICO project was officially launched. Funds raised during the ICO are used to market the product across Southeast Asia. - Ether cash back and SxP retribution process are added to the application. - The SxP token is added to major cryptocurrency exchanges. - Sales teams are set up to market the product in Southeast Asia. - Customers are able to pay using bank accounts as well as credit cards (bank to bank payments). - Customers are able to pay using Alipay, representing 450 million potential Chinese customers. - The inventory used by each seller is used to create a marketplace, enabling offline sellers using our solution to have a new eCommerce channel provided for free. - Integrate SelfPay with remaining eCommerce platforms and shopping cart services (e.g. WordPress, PrestaShop, Magento, Wix, Weebly, Shopify). We offer the possibility to each seller to exchange their blockchain assets seamlessly from one user to another in a decentralized manner, removing any risks that is usually associated with current centralized solutions.Each seller will be able to send transactions between each other using the SelfPay system, thus providing a B2B solution.Crypto rewards can be received in any major cryptocurrency and ERC20 tokens, enabling sellers to manage a multi-cryptocurrency wallet of rewards.Since fees are taken from the token transacted in, the most popular tokens used accumulate to the distribution contract, helping the value backing SxP tokens. Any seller can be paid directly in any cryptocurrency, achieving the original target to bring cryptocurrencies seamlessly to any seller.Internal exchanges setup to optimize the cross-sell between the crypto rewards given to sellers and the rewards withdrawn by the merchants. Local exchanges are still being used to provide liquidity when needed.The product is then being consolidated to integrate other Web 3.0 functionnalities coming from other blockchain projects including OMG, OpenBazaar and weTrust.